Ideally located to visit Paris by foot, this bed and breakfast offers an independant suite of 31 square meters with a private entry, a bedroom equiped with a Queen Size double bed, a private bathroom, a desk, a dressing. Bruno, your host, receives you in his private part of the apartment every morning for a breakfast prepared according to your wishes. 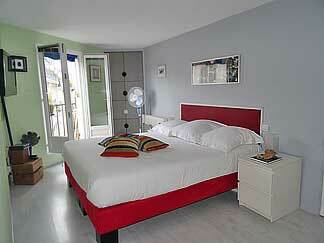 The bedroom is quiet, well lighted by day light and comfortable. At the times mentioned, every night gives you a reduction of 10 € (2 people).